There is a large stream that empties into the Connecticut River which forms the boundary between Middletown & Cromwell. This stream was originally known as the Sebethe River and is today known as the Mattabesset River. But in 1947, it was known as the Little River. Kent Cochrane photo from the collection of Max Miller. 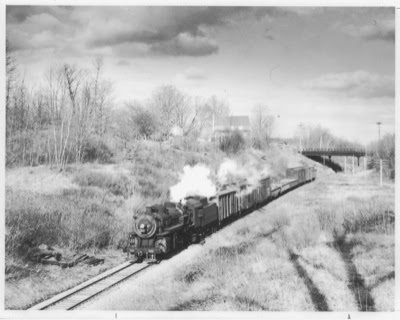 The above photo, which has been posted before on this blog, is from March, 1948 and shows K-1d #466 crossing the Little River southbound from Cromwell to Middletown. As beautiful a railroad as the Valley Line is overall, there aren't many outstanding scenic highlights, so whenever there's a neat bridge scene - especially one for which I have a photo - from the era I'm modeling - I just have to recreate it in model form. Bonus: That's John Wallace there holding down the fireman's seat (you can barely make him out). Middletown is off-photo to the left; Cromwell is off-photo to the right. The line at the back along the wall is the north end of Middletown yard (left) and the line to E. Berlin (right). My first (so far) Frog Juicer is on the back L-girder. I'd originally planned on using one of those Micro-Engineering 30' deck girder bridges here, cutting out the subroadbed from the joint on the left to the riser on the right. But looking at the Cochrane photo, I knew I'd at least need to change that plan to using one of the M-E 50' plate girder bridges. And that was the plan. Until today. As you can see, it's a LOT longer than I expected! In addition to the two abutments, there are actually three intermediate piers, of two different types of construction. And, as if that weren't enough, there are two short deck girder spans on each end between the abutments and the main bridge itself. Heh - those 30' M-E bridge kits I have will come in handy after all: as mere approaches to the larger plate girder spans. Go ahead - scroll up and look again at the amount of space I have for this scene. So I'm not quite sure now what my plan is for my model of the Little River Bridge area. As if the shortage of space didn't complicate things enough, this whole area is on a curve where (as you can see) the prototype is straight. This is yet another example of how doing a thorough job of field research early on is SOOOOO critical. If I'd only known "then" (during the design phase) what I know now (and continue to discover), I may have done things differently. But - thankfully - I really don't know exactly what I'd do differently. I suppose I could have spread things out more, to provide more space for scenes. But then something else would have had to go. Planning a model railroad is all too often like pushing a balloon through a keyhole - "druthers" in one area become the "givens" of another. But I suppose that's where the "art" of model railroading comes in. At the end of the day, even the best & most skilled of us are impressionists by necessity and the most effective model railroads are those that convey the prototype best, even - or perhaps especially - through the artifice of sense and illusion. Even if I removed the subroadbed all the way back to the risers, I'll only have about 15 inches to convey the Little River bridge scene. But if I do a good job of selective compression, and my "artistic" skills are up to the task, that 15 inches may be just enough. Here's hoping you'll stay tuned to see how I make out.